If there was one thing you could rely on during the nineteen-fifties, it was science fiction movies were not always intended to fill you with awe, nope, they were intended to frighten the wits out of you. Now, that desired effect may not have been always successful, and there are many works of this ilk which, looking back from a modern perspective, look somewhat ridiculous, laughable even, thanks to histrionic acting, poorly realised special effects, daft dialogue and plot twists that were patently absurd. But not every movie released back then was a Robot Monster or Plan 9 from Outer Space, there were plenty that survive as fascinating cinema. Of course, Hollywood studios made big budget science fiction - there was an appetite for it after all, as advancing technology opened up all sorts of brave new frontiers and gave rise to a new set of fears into the bargain, but much of the output was destined for the lower half of a double bill, as B-movies allowed free rein to all sorts of nightmares in the realm of the fantastical. Two of the most memorable such efforts were 1953's Invaders from Mars and 1958's The Blob, notable for all sorts of reasons, yet if you had seen them at an impressionable age, say on television or even theatrically as intended, their imagery and possibilities of fresh hells were hard to shake off. It's no coincidence that both these films were remade in the eighties, to varying degrees of success artistically and financially, for the moviemakers who had come of age watching them and others like them back in the fifties and sixties were keen to achieve the same sense of cosmic unease they had felt for a new generation. Seeing them now, it's difficult not to imagine, say, Stephen King finding their concepts and visuals feeding into his prose, using them to inspire his epic horror novel It, or the Quatermass-inflected The Tommyknockers, among a whole other selection of sequences or even entire books, and it is as instructive to return to these films as it is to his literature. In the fifties, very few took pulp shockers and speculative fiction as seriously as the mainstream concerns, never mind the highbrow material, they were for kids in the main, and if something did appeal to the adults it was not because of any great quality, it was because they were "fun", pure escapism. But look at the paranoia of Invaders from Mars, where a young boy (Jimmy Hunt) witnesses a flying saucer land one night in the sandpit at the back of his house, and it was difficult to dismiss the fact these efforts were tapping into something primal in the terror they were eliciting in their audiences, particularly when the aliens stage a takeover bid on Middle America. Imagine you are a kid, and your parents start acting strangely, not simply grumpy like they are having a bad day, but aggressive, hostile and even violent - would you entertain the idea they had been taken over by Martians? Maybe you wouldn't, but films like this depicting such scenarios would appeal since you could relate to a young character who was not believed by the adults he tries to appeal to, his worries put down to an overactive imagination. Only we - and he - are well aware they are well-founded, and part of the nightmare is not being believed when you are certain something has gone very wrong, just ask Kevin McCarthy in Invasion of the Body Snatchers. Invaders from Mars got in their first, though in Jack Arnold's contemporary It Came from Outer Space had a similar doubles plot, no less scary for the young 'uns, yet those aliens were more benevolent, ultimately. 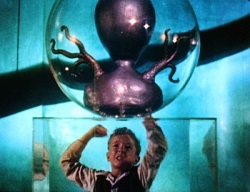 The fact that director William Cameron Menzies, a genius at design if less accomplished with his cast, allowed no such safety net was somehow more disturbing, and his wild art direction, all stylised sets and when we saw the Martians, almost goofy with its frights, rendered this a vivid memory for decades thanks to its public domain status making it cheap to show on television. Which is precisely what happened to The Blob. Don't underestimate a film's longevity in the public consciousness with its ability to be widely seen, and each of these projects were regulars on television and home entertainment releases for decades after - in fact, they still are. 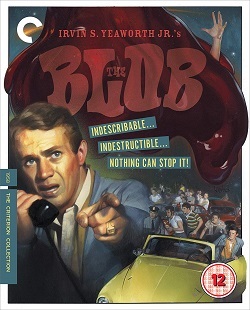 The Blob had the additional benefit of starring Steve McQueen in his first lead; famously, he didn't get on with its makers so his contract was not picked up for future science fiction movies, so instead of being the next Nick Adams he became one of the most popular movie actors of all time in blockbusters like Bullitt, The Thomas Crown Affair or The Towering Inferno, something he was presumably relieved about, though he reputedly remained a fan of this. Little wonder, it made him a household name at twenty-seven, playing the teenage protagonist "Steve", plainly overage but so were his fellow performers, and trying to convince the grown-ups that the meteor which landed in the nearby forest contained the titular goop that has eaten an old farmer who stumbled upon it. It was a notion almost brilliant in its simplicity, and for giving fifties audiences the heebie-jeebies it was ideal; even now, the thought of being digested by some kind of amorphous mass, and how painful it obviously was for its victims, is the stuff of nightmares as much as seeing your loved ones taken over by aliens. The Blob was well nigh insultingly basic, as a special effect it was merely a lump of red-coloured silicone variously oozing over and through crude models, yet its relentlessness was not to be underestimated. Producer Jack H. Harris new a good thing when he saw it, and rereleased this over and over, remaking it too with a 1988 effects extravaganza that unlike Tobe Hooper's Invaders from Mars do-over was actually surprisingly decent without overthinking the premise, and a further remake has been proposed for years. Yet what offered the original the edge was similar to what made the 1953 flick so unsettling at the time: not being believed. About half of The Blob sees McQueen and girlfriend Aneta Corsaut trying to persuade authority figures there is a genuine threat that could, if allowed to get out of control, consume every living creature on Earth, only to be greeted with extreme scepticism from every quarter, until the menace makes itself known to them by eating someone close by. That frustration was just about as keenly felt as the revulsion of what the alien substance was doing to its victims: combine those two elements and you had a surefire hit that viewers would return to again and again, it just had that certain something that made it near-universally appealing. But which film was scarier, The Blob or Invaders from Mars? Heck, let's call it a draw, they both satisfied on their own terms as cult classics of unease from an era when science fiction and horror had a superb grasp of the world's fears.